Imperialdramon (Paladin Mode) is an Ancient Dragon Man Digimon whose name and design are derived from "Imperial Dramon Paladin Mode". 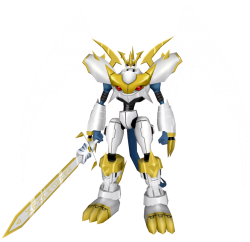 A form of the Ancient Dragon Warrior Digimon Imperialdramon (Fighter Mode) that acquired the power of the holy knight Omnimon, powering up and changing form into a legendary holy knight (Paladin Mode). As the final, strongest form of Imperialdramon that was told of since ancient times, it descended in a time of great disruption in the ancient Digital World, and rescued the world from complete collapse. However, all of the details of that era are a mystery, and if research into Digimon and the Digital World progresses, it is likely that they will eventually be clarified. Its Special Move is cutting the opponent in two with a single stroke of its ultimate "Omega Blade" sword, resetting and clearing their configuration data. The DigiCode on its Omni Sword reads "INITIALIZE". Imperialdramon (Paladin Mode)(Jogress) was added to Korean Digimon Masters on September 18, 2018. Slashes the enemy with Omega Blade to initialize data. Radiates energy waves ten times as destructive as Mega Crusher from the entire body. Positron Laser. Light attribute 10 seconds cooldown 663 DS consumed 3 skill points per upgrade Learned at Lv. Launches energy blast from its right hand cannon and inflicts damage to targets within range. The third skill is an area of effect hitting every enemy around the target. This page was last modified on 26 February 2019, at 05:01.